Bill Smith, ARRA Editor: Americans for Prosperity (AFP) has been investing a lot of time and resources in Arkansas. Can we hope to see an AFP State Chapter established in Arkansas? 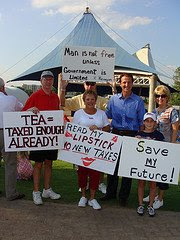 On Monday, at the Arkansas Tea Party event in Little Rock, Tim Phillips, President of Americans for Propriety spoke to hundreds of fired up citizens who wish to keep the pressure on Washington politicians to rein in spending and stop the tax increases on our families and businesses. Phillips is President of both AFP and the AFP Foundation; a premier grassroots citizen lobbyist organization that focuses on promoting the free-market and issues such as budget reform, lower taxes, government transparency and accountability. Last Month, Phillips literally dropped in to Little Rock and Fayetteville in a Hot Air Balloon as part of AFP's National Cap-and-Trade Hot Air Tour. The tours next stops will be in Montana, North Dakota, South Dakota and Nebraska. In addition, AFP has established in Arkansas a Patients United Now team, led by Teresa Crossland-Okee of Rogers, Arkansas to focused on educating the public about the threat of government controlled health care. Teresa repeatedly shares, “Some are projecting that a government take-over of health care will cost a billion dollars a day. When it comes to health care and health care decisions for patients, we can’t afford to have a federal bureaucrat ‘guessing wrong’ on treatment decisions.” They have held several tour stops and participated at several events across Arkansas with several more planned. The next Patients United Now Tour will be in Bella Vista, Arkansas on Monday, June 22, at the Blowing Springs Pavilion in Bella Vista, from 5:30-7:00 p.m. Speakers include former Congressman Asa Hutchinson, State Representative Tim Summers, Dr. Larry Hunter, senior policy expert for Americans for Prosperity and President of the Social Security Institute, as well as local doctors and business persons. The event will be held at the Blowing Springs Pavilion and free dinner and drinks will be provided to the first 200 participants. At the Little Rock Tea Party. Tim Phillips shared: Things are hotter for Senator Lincoln who continues to stay on the fence when it comes to the job killing energy tax called "Cap-and-Trade." Senator Lincoln also refuses to rule out supporting President's Obama's government health care takeover that will mean a government bureaucrat between patients and their doctors, long lines for doctor's appointments, and worst of all medical procedures denied based on age or chronic illnesses. 2. Will the biggest job-killing, energy tax in American history pass as legislation called "Cap-and-Trade"? We have at most two months before the decisive battles in the U.S. Senate this September. We've got to be ready for an all-out effort to win these two vital issues. Will you take two steps to help us get ready for the decisive Senate battle over Cap-and-Trade and health care? Urge your representatives to sign our No Climate Tax Pledge, and let your elected officials know that you're watching how they vote on hidden energy taxes. Tell your representatives to Vote NO on any bill that puts bureaucrats before patients. One last thing, remember that the Obama-Pelosi $1 trillion "stimulus" we fought so hard to defeat? President Obama and Speaker Pelosi promised the massive spending bill would create jobs and turn around our economy. Did you see Vice President Joe Biden on NBC's Meet the Press this past Sunday when he was asked why so many jobs were still being lost even months after the Stimulus bill passed? Biden actually said, "Everyone guessed wrong." Think about it. They spend $1 trillion that we don't have -- taking us deeper into debt -- while promising Americans that their spending binge would "create jobs." Then, when job losses mount despite the massive spending, they shrug their shoulders and say, "Well we all guessed wrong." Cutting taxes and government spending in order to halt the encroachment of government in the economic lives of citizens by fighting proposed tax increases and pointing out evidence of waste, fraud, and abuse. Tax and Expenditure Limitations to promote fiscal responsibility. Removing unnecessary barriers to entrepreneurship and opportunity by sparking citizen involvement in the regulatory process early on in order to reduce red tape. Restoring fairness to our judicial system. Americans for Prosperity has numerous state chapters. To learn more, visit the AFP website; sign up and get involved! Tags: AFP, Americans for Prosperity, Arkansas, Bill Smith, cap-and-trade, events, healthcare, tea party, Tim Phillips To share or post to your site, click on "Post Link". Please mention / link to the ARRA News Service. Thanks!